For celebrating of New year the average Russian will spend 537 euros, according to Deloitte company’s research “Celebratory mood-2008” which was held in the end of September – the beginning of October, 2008. For the third time Russia takes part in the research of consumer activity “Celebratory mood” by Deloitte. In total the “Celebratory mood – 2008” is based on the polls of consumers of 17 countries of Europe and Africa. In Russia inhabitants of Moscow, St.-Petersburg, Novosibirsk, Nizhny Novgorod, Rostov-on-Don and Ekaterinburg were asked. People in France are ready to spend 527 euros for New Year; the average Belgian – 597 euros. The Irish came out to be the unthriftiest – they spend 1355 euros, opposing 235 euros in Ukraine. 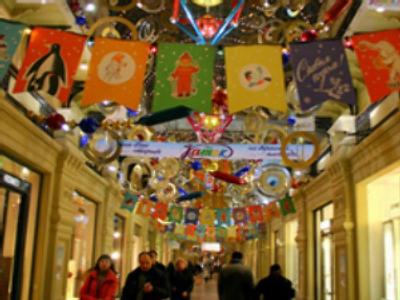 36 per cent of Russians hope to receive money as a gift for New Year; 22 per cent expect to be given cosmetics and perfumery, 19 per cent would not be against clothes and footwear, and only 17 percent hope for jewellery and watches. To give Russians plan cosmetics and perfumery (45 per cent), clothes and footwear (30 per cent) and foodstuffs (28 per cent). 90 per cent of asked by Deloitte have not bought any gifts yet. However, since October the economic situation in Russia has worsened, therefore many experts interrogated by the edition believe that conclusions made by Deloitte will hardly come out correct.